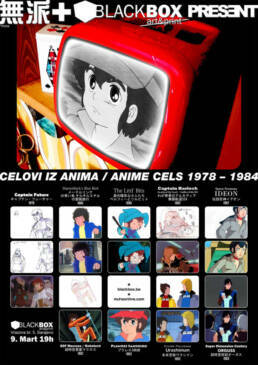 I would like to invite you to a very unique exhibition in our city, where original cels, in-betweens, extremes and storyboard scenes, from the Japanese animated series from the early 80’s, will be presented. The visitors will be able to see different phases of a classical 2D animation through 60 original exhibits from 9 anime, out of which 5 have made an international cult status. 1983 – Super Dimension Century Orguss (超時空世紀オーガス). The title which needs a special emphasis is certainly SDF Macross whose first series is well known in this region under the name Robotech. The next one is Captain Harlock: Arcadia of My Youth – Endless Orbit SSX from a renowned author of manga and anime, Leiji Matsumoto, well known to a large audience for Daft Punk videos from the album Discovery, that will lead to the creation of Interstella 5555: The 5tory of the 5ecret 5tar 5ystem animated musical SF movie. Captain Future is anime that is still played on German TV station ZDF. Space Runaway Ideon is a project of Yoshiyuki Tominoa, the creator of Mobile Suit Gundam, and it was an inspiration for Hiddeaki Anno´s Neon Genesis Evangelion. Super Dimension Century Orguss is a second serial from the Super Dimension trilogy, based on SDF Macross as the first series, the Super Dimension Cavalry Southern Cross as the third, and it was used as a continuation of Robotech saga. Although initially not planned, all 3 series from the Super Dimension trilogy are part of Ideon (or Macross)Universe. 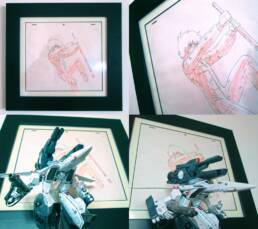 It will be a very interesting exhibition for animation and anime fans. Julijan Komšić, BlackBOX gallery, exhibition host. I would like to thank Julijan Komšić & Srećko Hrkač, BlackBOX print shop and gallery, for creating safe space for alternative arts and artists, a place for new artists to realize their creation, and for the support in this non-commercial project. It is continuation of our friendship in tradition of Ukiyo-e.